When online pre-sale closes, you may still purchase tickets on site at Welcome Center. with a weekend-long celebration of floral design and beautiful antiques. The mansion is transformed into a wonderland of color and fragrance as each floral designer handcrafts a display to highlight and harmonize with the sumptuous interiors of the historic mansion. 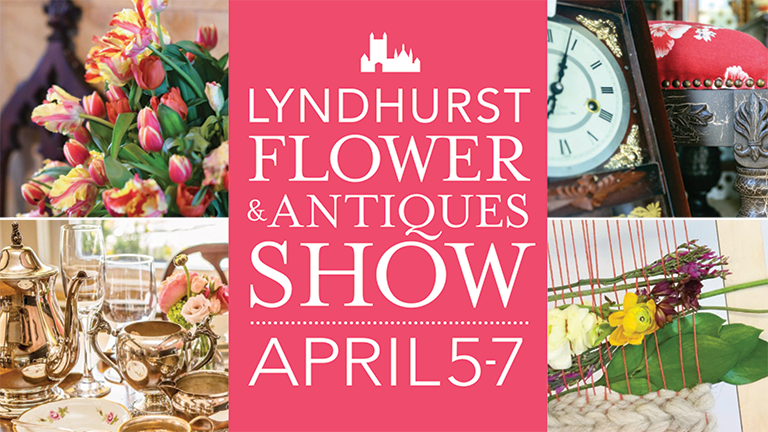 Each spring, thousands of visitors take advantage of this rare opportunity to experience Lyndhurst mansion awash with flowers and to walk through the home without a guided tour. Tickets for this weekend are for general admission with timed entry. You may enter the mansion between the one-hour time frame of your chosen time slot. To save $5 on Antiques Show tickets, add Flower Show tickets to your cart and choose the option to add Antiques Show tickets at check out. All ticket holders must check in at the Lyndhurst Welcome Center before proceeding to the mansion. Lyndhurst welcomes all visitors, however, as a historic building, only the first floor of the mansion is wheelchair accessible. No large bags or backpacks will be permitted within the mansion. Children under 18 years of age must be supervised by an adult at all times. If the mansion is at capacity, you may be asked to wait briefly in the Welcome Center before proceeding to the mansion.